Snrky: I'm glad we have a meeting game plan. I'm glad we have a meeting game plan. Per my coauthor's last post, we've had a reboot! Did you remember to shut down completely to make sure you're seeing the right comic and not some sort of cached data? We'll give you some time right now. Power down and then come back. I like the idea in this comic. The whole point of consensus-based estimation is not to have anchoring or collaboration between individuals because it discourages the surprise edge cases from coming up during the planning. But where do you draw the line between the developers all having good information going into the meeting and communicating well, versus trying to surface something? Me. I'd lean in favor of lots of information and good communication and hopefully the "I don't know" still surfaces during estimation. Online, others seem to agree, with estimation meetings being very short, implying all the information is available beforehand. A description of Boris Gloger's magical estimation he refers to can be found here. Title: I'm glad we have a meeting game plan. 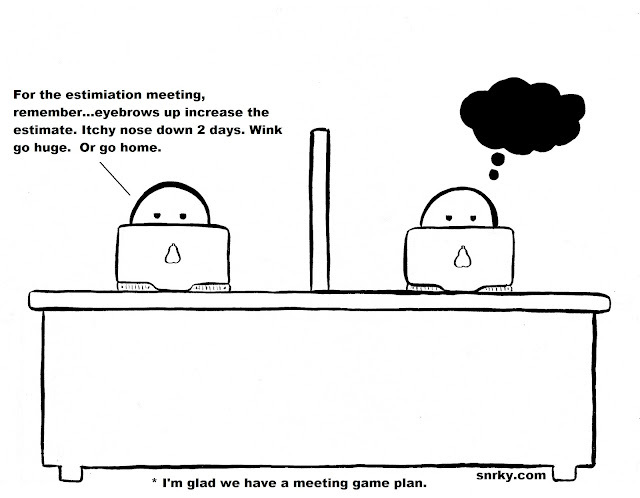 Snarky: For the estimation meeting, remember...eyebrows up increase the estimate. Itchy nose down 2 days. Wink go huge. Or go home.